"Atty Had to Lay Off Wife" (from the ABA Journal). Update: From the same source, a clue as to why some lawyers may have to sleep alone. Some twenty or so years ago, I was on the phone with a lawyer in Seattle who represented my then employer in some litigation. We were discussing the judge's decision on a motion, which had gone against us, when, in mid-sentence, he broke off and said, "Wow! I haven't seen this in years." "What? ", I asked, thinking he had spotted something odd in the judge's opinion. "There's a whale in Seattle harbor", he replied. Well, now it seems, there's a whale, a humpback (like that in the photo) in New York harbor, as reported (with WNBC video) in this post from Gawker. Since the critter was swimming in the Narrows, near the Verrazano-Narrows Bridge, it could easily have been spotted from the promenade at Bay Ridge. As the Gawker post points out, this isn't entirely happy news. New York harbor, because of its heavy ship traffic, isn't an ideal environment for whales. Thanks to Tom Turner of NYC Maritime for the tip. 4.10 update: Nick's prayers (see comments) are answered, as WQXR reports that the whale is safely back in open ocean. Starting their season on the road against Cincy, the Mets managed a 2-1 win. On the pitching side, the omens are encouraging. Santana went five and two thirds innings, yielding one run on three hits while striking out seven and walking four. The bullpen was unscathed for the remaining three and one third innings, covered by Green, Putz, and Rodriguez, who notched his first save as a Met. Defense was flawless save for one throwing error charged to Delgado. On offense, things looked disturbingly plus ça change: lots of runners stranded as Mets batters scattered nine hits. Both RBIs were by Murphy: one on a solo homer, the other on a groundout. The Mets now have a 31-17 record for season openers. Fusspot fan that I am, I'm tempted to see an opening day win as a bad sign. 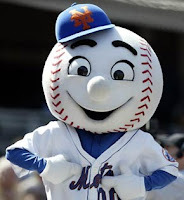 History is equivocal: the 1969 "miracle" Mets opened with a loss to the expansion Montreal Expos, while the other World Series winning Mets (1986) started with a win over the Pirates. Update: Yanks lose their opener, also on the road, to the Orioles, 10-5. Sabathia gets pounded in his first regular season start in pinstripes, giving up eight hits and six runs, with five walks and no strikeouts. The late Tommy Butler, Lion's Head bartender and model for Big Zeus in Dermot McEvoy's Our Lady of Greenwich Village, who grew up a New York Giants fan, once said it took some years before he found a Mets win as satisfying as a Yankees loss. 4.8 update: Mets make it two in a row. This time, pitching is shaky but the bats come alive. Yanks lose again, as it's Wang's turn in the barrel. 4.9 update: Fortunes are reversed as Perez continues his exhibition game agonies by giving up eight runs, though the bullpen averts any further damage for the remaining four and two thirds innings. Result: Reds 8, Mets 6. Meanwhile, the Yanks get five plus strong innings (two runs allowed) from Burnett, a flawless bullpen for the remainder, and five RBIs from Nick Swisher, to crush the Orioles 11-2. Lisa Swan loves Citi Field. Lisa Swan, the (may I still use this term without being unforgivably un-P.C.?) distaff side of Subway Squawkers, and, unfortunately, the Yankees' side of same, likes the Mets' new digs. She also takes exception, as do I, to Mets fans booing Oliver Perez over a poor outing. Nevertheless, I'm compelled to point out that Yankee fans are not immune to the booing your own affliction. Not only is this a better song (with a stunning lead vocal by Emmanuelle "Manu" Monet), but its adoption by the Mets will, no doubt, assist President Obama's effort to improve relations with our European allies.